Tips on becoming a star baker! Are you a whizz in the kitchen or a wanna-be-baker? Don’t forget to stock up on all your baking essentials from ProCook, Denby and Villeroy & Boch stores at LDO – and all at outlet prices, too! – before you get started. 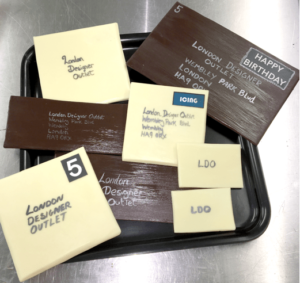 Make your own chocolate birthday cards, just like the ones Prudence created for LDO. Powdered Edible colour of your choice, black or silver works well. Break up or grate your chocolate into small pieces and place in a plastic microwavable bowl. Melt the chocolate in a microwave in 30 second blasts, stirring really well each time until the chocolate is just melted and still not too hot. It should be just warm. Stir until any solid pieces are melted. Pour the chocolate into a metal baking tray, and spread thinly. Chill in a fridge for 10 minutes until set. Place the chocolate slab you have made on a chopping board and use a sharp knife to cut neat squares or rectangles to make the shape of an envelope. You can use a clean ruler to help guide the knife. Mix edible colour with a little confectioner’s varnish in a plastic disposable cup to make paint, and hand write/paint the recipients name or address. You can use an edible ink pen if you prefer. Serve on top of a cake, or just eat it! One of London’s most recognisable landmarks, have a go at making your own version of Big Ben from buns! Arrange 5 of the buns into a tall rectangle adding a little buttercream in-between each bun. Choose the best fit to make a tall neat upright rectangle. Secure these with the bamboo skewers pushed through the middle. Cut the remaining bun into 2 pieces, one bigger than the other, and cut them into pyramid shapes. Cover the cake board with the chocolate and while it is still melted attach the bun tower to the board. With the left over white chocolate, use a teaspoon to make 4 buttons on the greaseproof paper, and leave to set. When the chocolate buttons are set, draw on clock hands with the edible ink pen. Add these to the tower, fixing them on with a little melted white chocolate. And if you’d like to see what Britain’s leading food artist created of LDO and other famous London landmarks, view our gallery of images.